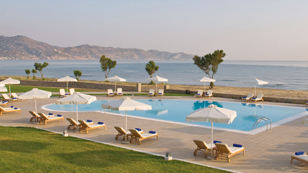 The resort operates between April and October, inclusive. TUI Magic Life Candia Maris is built on the beach of Amoudara, very close to the city center of Heraklion and the International airport. The location is perfect for guests who wish to explore both the East & West coast of the island. During the months of November until March, inclusive, the resort is not in operation for eventual stay. For any additional information you may need, do not hesitate to contact us at any time.